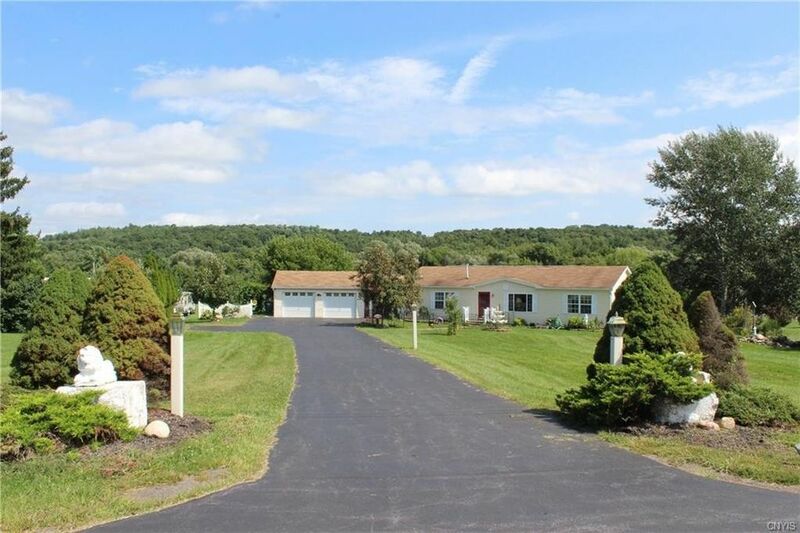 This 1500+ square foot 14-year-old Camillus ranch on 8 acres has much to offer. The picturesque site that borders the historic Erie canal includes a 4.68-acre approved building lot valued at $30, 000. Public water and sewer are a real bonus for such a large parcel of land. The home features a breezeway, leading to family room and three season room that overlooks the professionally landscaped rear yard. The eat-in kitchen with center island and cathedral ceilings leads to a formal dining room that opens into the living room with fire place. The expansive master bedroom includes bath with double sink and double door entry. Recent improvements include new floor coverings, remodeled bath, and new front load washer/dryer, Less than 5 minutes from township 5 and easy access to major highways. Directions: From Camillus Village - GEnesee Street to Newport Road - 1.2 miles to subject property on the right.